Wakesurfing is a water sport in which a rider trails behind a boat, riding the boat’s wake, without being directly pulled by the boat. You get up on the wake, typically using tow rope to pull you out of the water. More advanced riders will start on the swim platform with their board resting on the edge and once the boat is up to speed the rider will ease themselves back until the find the “sweet spot” of the wave. Once the sweet spot is found the rider can let go of the rope and continue to surf hands free. In general wakesurfing is done by using special boards, designed specifically for wakes. Wake surfs range from 4’6 – 6′ whereas surfboards for the ocean range from 6′ – 12′. The boats that are preferred are tournament boats, which are inboard ski boats with direct drives as the propeller is under the boat, it is nearly impossible for the rider to make contact with the propellor. These boats are also made so that you can hold extra ballast systems, such as water, lead weights, concrete, or other heavy objects in different sections of the boat in order to weigh the boat down and create a larger wake. The ideal wake for surfing is created by positioning people and ballasts throughout the boat with the majority of the weight being in the back and on the side that is being surfed. The deeper the boat sits in the water the bigger and better the wake. When surfing, you only need to travel at about 12 mph making it very laid back and fun for all ages! Beside the technical aspect (and most importantly) this sport is just a lot of fun when you get the hang of it suited for all ages and it really is not as hard as it seems. Pumping – Turning up and down the face of the wake to gain speed. Stalling – Applying pressure to your back foot to slow down or “stall”. Floater – When a rider and board “floats” on top of the wake. Lip slide – Just like a floater, but the board is sideways. Spray – Gouging into the face of the wake to create the water under you to explode and spray. Fire Hydrant – Placing one hand on the board and taking your front foot off. Posing – Doing hand and body positions while riding for cool style points. Hang 5 – Rider extends front foot (toes) over front of board. Rail Grabs – Grabbing the board’s rail while the board is on the wake – one or both hands. Cutbacks – Bashing off the lip of the wake with the board – the more extreme and risky the better. Paddle back in – Going to the extreme rear of the wake, throwing down on the board and paddling back into the power zone. This can also be done by pulling the outside rail of the board to bring it back to the power zone. Tubing It – Throwing down on the board and sliding back into the tube until covered up – the deeper the better, and then popping out and standing back up on the board. Switch Stance – Riding with the opposite foot forward. 180 spin – Spinning 180 on the wake – Board and rider spin. Airs – Launching off the lip with board into the air and landing back on the wake (toeside or heelside). One Hand Grab Air – Grabbing one rail of the board while the board is airborne above the wake. Double Grab Air – Grabbing both rails of the board while the board is airborne above the wake. Hang 10 – Rider extends both feet (toes) over end of board. 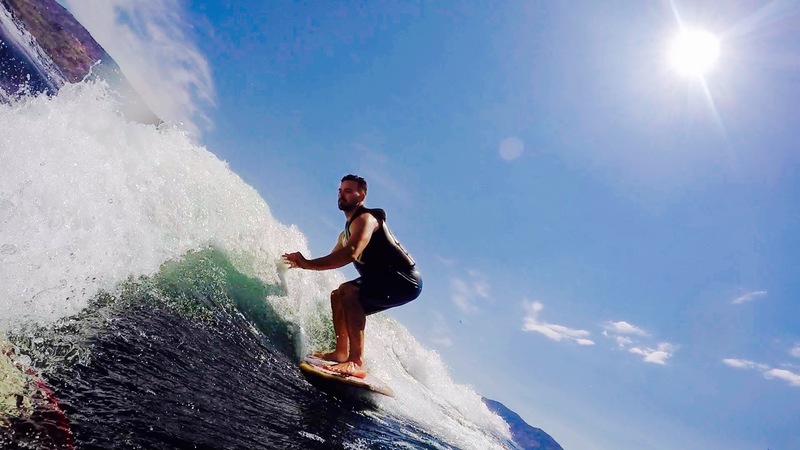 360 spin – Spinning 360 on the face of the wake – Board and rider spin. 540 spin – Rider spins continuously 1 1/2 times until he is riding switch stance forward. Rider spins continuously 2 complete 360′s. Air 180 – Doing an air while spinning 180 the blind direction. 180 air – Doing and air and spinning a 180 in the air and landing in with a switch stance. 180 shove it – Spinning just the board 180 under your feet and landing with the board “backwards”. 900 spin – Rider spins continuously 2 1/2 times until he is riding switch stance forward. 360 shove it – Same as a 180 but you spin the board a full 360 under your feet. Note: rider does not spin only the board spins. Big Spin – Same as a 360 shove it, only the rider spins a 180 at the same time the board does a 360.